A poet, a creative nonfiction writer, and a prose writer who edited an anthology discuss their new books, all coming out this fall. They ask such question as: Is political writing inevitable or a deliberate choice? How can literature spark change and improve the lives of women and people of color in our country? Sarah Fawn Montgomery: Let’s begin by talking about the origins of your books. What prompted these projects? 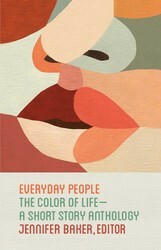 Jenn Baker: My friend, Brook Stephenson, was the originator of the anthology Everyday People: The Color of Life. He passed away unexpectedly before it could come to fruition. This project was something he proposed as a much-needed Black short fiction anthology and he sold it to Atria Books (an imprint at Simon & Schuster) on proposal. So it was in limbo when the editor who acquired this anthology reached out to me to make it happen. Marianne Kunkel: The morning after the 2016 presidential election, while I was putting on makeup, I started thinking about the various beauty rituals many women put themselves through to be taken seriously and succeed in their careers–and how at that moment, just after the first woman presidential candidate of a major political party had lost, that particular ritual didn’t feel worth my time, money, and energy. I thought the vantage point of makeup products was so intimate, yet there’s tension in the fact that many people who wear makeup treat it carelessly, throwing it out or losing it at the bottom of a purse. 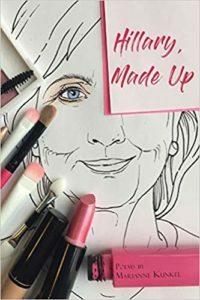 So, from all these thoughts, I conceived Hillary, Made Up, a book of poems entirely from the voices of makeup and hair products to Hillary Clinton, spanning her early political career to a few months after the 2016 election. Sarah Fawn: Mine was prompted by wanting to voice the inexpressible, to speak against the silence so often inflicted upon patients. I was also interested in challenging narratives of inspiration or recovery I often see associated with disability, for my experience as a patient was painful, ongoing, and incredibly frustrating. The project began as a coming to voice—both as a mentally ill woman but also as a writer—and moved in unexpected ways from there. Marianne: How long ago did you both begin working on your books? The call for greater representation in literature is growing stronger, and both of your books champion greater understanding and respect for diversity. As you prepared for the publication of your book, and also watched American politics shift in different and dramatic ways, did you add or change anything to anchor your book to this time in American history? Jenn: Everyday People was always rooted in prioritizing the stories of people of color. My involvement mainly meant switching that focus from an all-Black anthology to a PoC-representative anthology—this meant including Indigenous, Asian/Pacific Islander, and Latinx voices as well as Black ones. I do wish I had additional room, time, and money to have included more representation within disability and LGBTQ+ communities. Of course that does not dismiss the power of the stories and authors included in this anthology. So for us, as PoCs our lives are always anchored in American history, WE are America’s history. The problem tends to be that our stories are not validated nor are they seen as such. And we have to constantly fight for that and fight for stories that are not constantly imbued with our trauma but with our joys as well. Sarah Fawn: I first began writing about mental illness several years ago. My early attempts were essays about anxiety, obsession, and trauma, but the focus was always loose and fairly tangential. I never imagined I’d write a mental health memoir. But the more I experienced as a patient, the more I wanted to write about what it is like to navigate mental illness in a culture that values independence, productivity, and “by the bootstraps” mentality, the very traits that can lead to mental health challenges for so many. The book always explored how misogyny shapes mental illness and the conversations and treatments surrounding it, but the significance increased with the 2016 election and our current social and political climate—I felt compelled to add an epilogue directly addressing my experience navigating the academic job market and larger world as a mentally ill woman during the election, which was ripe with sexism, ableism, and the gross abuses of power I seek to dismantle in the book. The book had always contained a lot of research into the history of mental illness treatments, the treatment of women, big pharma, and the ways politics shapes public health, so recent political accusations of insanity and threats to health care were the latest rhetoric in a long historical dialogue. Marianne: Honestly, I worry that my book is too anchored in one brief political moment. I wrote the poems rapidly last summer, producing about one a day, because I knew my topic was time-sensitive. Several of my poems have epigraphs of quotes from 2016 presidential rallies, interviews, and cable news programs; I wonder if readers will remember the context in which those epigraphs were uttered. I wonder if my son, to whom I dedicated my book, will be taught the play-by-plays of this historic election in school. While my book may not stand the test of time, I’m cheered by the fact that Clinton, my book’s subject, is as vocal as ever, which tells me she’ll be relevant in the public eye for a long time. Regarding greater diversity in literature, while researching the American beauty industry to write Hillary, Made Up, I kept reading about long-standing racist practices such as makeup for people of color not being available in stores–and the products that are available are often placed at the bottoms of aisles with security caps on them. Although the conceit of my book was to write about Clinton, a white woman, I wanted to address this racism and include people of color in my discussion of makeup. One of several results is my poem “Eye Shadow to Hillary,” in which a 24-color eye shadow palette expresses frustration that Clinton only wears its palest hues; I’d seen and read how beautiful bold, bright eye shadow can look on people with darker skin tones, so I imagined the eye shadow wishing it could belong to a presidential candidate who’s not white so more of its palette could be used. This was my not-so-subtle way of hoping that someday a woman of color will run for president! Jenn: Speaking of being “political” in our work as artists…the “perception” can be something that makes people uncomfortable due to an assumption these lessons are meant to convert them rather than bridge empathy. I believe that my existence as a woman of color is a political act, so why wouldn’t my art be? Do you share that thought process or see it from a different angle? Marianne: Jenn, I love your idea that your very existence is a political act. I realize Hillary Clinton is an incredibly polarizing figure–many people love her and just as many hate her–but I didn’t set out to be controversial in my selection of her as the subject of my book. I simply wanted to explore the sexism that went into her campaign and how voters evaluated her, and because I’m a woman, and because I minored in women’s studies and specialized in women’s and gender studies for my Ph.D., I’ve thought a lot about sexism. There are times when I wish I’d written a “safer” book, whatever that means, but my goal isn’t to persuade people to feel a certain way about Clinton. All I hope my persona poems do is give readers a glimpse of her apart from us, only her and a makeup product, to consider the divide between what we assume about her and who she is, what we expect of her and what she wants for herself, and whether or not we can ever truly know a woman politician while demanding that she “cover up” with extensive makeup, hair products, female-coded gestures, etc. Sarah Fawn: There is a large pressure when writing about illness to be inspirational, cured, somehow in recovery. Audiences are often only willing to listen to a hard story, a sad story, a painful story if there is some kind of redemption in it. But mental illness doesn’t work that way and so the expectation is problematic in that it asks folks to perform suffering and recovery, to somehow achieve “health” if an audience is to value the story. But my book can’t follow that narrative, because it simply isn’t true of my experience. Some folks might feel uncomfortable—I write about mental illness, trauma, abuse, and everyday ableism—but I wanted the reading experience to be as uncertain and unnerving as mental illness. I wanted it be immersive. American culture is centered on wellness, on productivity, on silencing negativity, all of which erase stories like mine, leading to increased stigma and rising rates of mental illness in this country. Much of my book is about occupying uncomfortable spaces, critiquing attitudes towards mental illness that require sentiment, apology, and suffering, rather than an interrogation of these practices and health care systems. Marianne: Shifting the discussion to craft, a couple of early readers of my book encouraged me to arrange the poems in chronological order, but ultimately I opted to categorize them by body parts (eyes, skin, and hair). Can you talk about ordering your chapters or stories, and how personal a decision this was for you? Jenn: When it came to ordering everyone’s fiction I made a point to (a) not put the same ethnicity side by side & vary themes, and (b) put the newer/original stories first. So you wouldn’t necessarily find two stories centering grief back-to-back. I also knew how I wanted to start and end the anthology. Courttia Newland’s story “Link” is political and has notes of Octavia Butler that I love. “Link” spoke to what was going on in London and all over the world due to a recognizable tilt in how we looked at our societies due to the recent election. The United States could very much relate to that as well. Because of the strength of that discussion point and how much each story varied I wanted to have readers experience things in different nations and also in different emotional stages throughout the anthology. I also play with organization to represent the experience of mental illness itself, which is full of gaps and pauses, missing time and blank memories. Mental illness rewrites your reality and so I try and do the same with form, embodying the frantic nature of anxiety, the repetition of OCD, the flashbacks of PTSD in the prose. My hopes are that the read is immersive, because I did not want to translate my story into the “real” world—I wanted readers to translate themselves into mine. Jenn: Along other craft lines, being that you are both poets—and I write prose because I know my strengths—I’d also love to hear more about how you look at the page. I have such respect for how poets utilize and express so much in so few words. Sarah Fawn, since your memoir is coming out did you feel a sharp contrast in how you wrote the memoir versus how your chapbooks came about? Sarah Fawn: Writing poetry helped me get closer to the truth in my nonfiction, and while Quite Mad is not categorized as “poetry,” it is governed by a poetics of mental illness. The language of mental illness—one complicated by rigid standards of “truth” and “fact” in nonfiction—is one imbued with the freedom of poetry. Poetry’s use of image, rhythm, syntax, and movement have all helped me as a writer, but most of all, I value its freedom to create a new normal. As someone whose day-to-day reality can be quite different from the rest of the world, poetry feels like coming home. There has definitely been a contrast, however, between the release of my nonfiction and my poetry chapbooks, the most recent of which explores madness through the persona of historical and literary madwomen. With poetry, no one assumes the speaker is me, but this is hardly the case with a memoir, and readers of Quite Mad have commented on my life, my family, and my personal practices with ease. I’m still adjusting to strangers entering my life so casually, having access to my story, my health, my very brain and body. Marianne: Sarah Fawn, I’m amazed that no one’s assumed the speaker of your poems is you! Often people think my poems are autobiographical unless I tell them otherwise. With Hillary, Made Up, I was able to prevent assumptions that the speaker is me by making the speaker an inanimate object–always a makeup or hair product. But the poems are more personal than they appear. By embodying inanimate objects, I tried on many different attitudes that Americans hold toward Clinton–lipstick resents her, brow gel adores her, eyeliner wants to see her fail, and so on. Inhabiting these myriad attitudes required me to empathize with many people, especially Clinton herself, which was emotionally exhausting, and maybe reveals more about me and my writing process than a more overtly personal book. Regarding how I approach the page, I had fun letting the shapes and sizes of some of my poems imitate the makeup or hair product they were about. My poem “Nail Polish to Hillary,” for example, is 20 lines long to match the number of fingernails and toenails on a human body. I used a lot of indentation and white space in my poem “Butterfly Clip to Hillary” to mimic the flight of a butterfly. But for other poems, I had to turn this part of my brain off so the poem could take the form it wanted. Sarah Fawn: What were the most difficult challenges you faced putting these projects together? And what were the moments where you felt like you were onto something? Jenn: One of the biggest challenges for me is continually being a woman of color as an editor with “power.” In that sense being the editor doesn’t mean you’re always understood or respected and this happens a lot in the industry whether folks would like to believe it or not. When I had to maintain my stance against material that wasn’t working for various reasons due to offensive material or otherwise, it was jarring, but not unexpected, to receive not only pushback but disrespect due to misogyny. I do want to be clear that everyone in the anthology was a joy to work with, respectful and respected, and I adore their stories and them as people. But that doesn’t mean in the process work doesn’t get weeded out. And it certainly doesn’t mean egos aren’t involved and personalities clash and things do not work out. It’s not all rosy all the time. As a woman working in this industry we have discussed disparities but those disparities can occur more often than one thinks and we may be dealing with that in silence or alone due to the lack of resources or the lack of community. Luckily, I do have a very solid community and I am incredibly grateful for how Everyday People came out in the end. Marianne: One of the difficulties of writing a themed book such as mine is sticking to that theme. It was hard for me to write a poem about every makeup or hair product out there, simply because I haven’t used them all! Bronzer, setting spray, lip liner… I don’t have much experience with those products, so I put off writing poems about them. But it was important to me to represent every product to show readers just how huge the makeup and hair business is. An average American woman spends $15,000 on makeup in her lifetime, and while some choose to wear it as a source of self-empowerment or artistic expression, others wear it begrudgingly. I wanted readers who don’t wear makeup and know little about it to see how much time, money, and energy goes into it. I finally wrote those poems about products I don’t wear by talking with friends who wear them, watching YouTube tutorials, and going to makeup counters to ask for product information. Jenn: Something I’ve noticed as a “running theme” in my work is the idea of expectation. Especially for women of color but also in general based on “gender norms” or “societal conventions,” etc. It seems like all our work touches upon that if not speaks to it/pushes against it in some way. Do you feel this may be conscious on your parts or do you happen to notice this as an element of your work that may be seen as inherently political? Sarah Fawn: Absolutely—mentally ill folks are stigmatized for moving through the world differently, for perceiving pain, fear, sadness, and anger “incorrectly,” the abstract concept of “health” involving assimilation, performance, normative behavior. This is, of course, further complicated by gender, race, sexuality, class, age, location, etc., all of which have been deemed “deviant” and “mad” throughout America’s history of medical treatment. 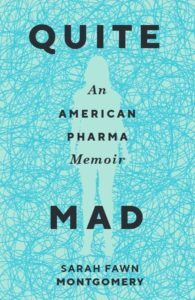 Quite Mad isn’t just a story of mental illness, it’s a story about the expectations we put on people to perform sane, particularly women, who are diagnosed and treated for mental illness at much higher rates than men. Marianne: One theme I noticed taking form as I worked on this book is the expectations between politicians and citizens. The commercial aspect of my book is fitting since we commercialize and commodify our politicians, especially in this increasingly digital age. But something that isn’t talked about as much is that politicians commodify us, too; how can they know us all, even though they’re working to represent us all? Surely they make their own homogenous assumptions about what we’re like. So with my book and its tireless display of makeup product after makeup product, I hope to demonstrate the superficiality of politician/citizen relations and encourage readers to approach news coverage, voting, canvassing, etc. with more thoughtfulness. Jenn: A big fear within the artist community is that when things are increasingly dire and communities are fearful for their homes let alone their existence, does art matter? How do we create art let alone sell it now? I firmly believe art is essential, but I also wonder in times like these what stories are more proliferate: ones offering hope, ones that entertain, or those that serve as mirror images and make us question rather than concede? Maybe it’s all of the above? Marianne: There were days last summer when worrisome national or global news would break, and I’d wonder if writing poems about sexism in politics was a solution. I believe in art as a means of feeling less alone, discovering beauty, changing minds, and more, yet ultimately I chose to supplement my poetry-writing with other forms of activism–marches, phone calls to my senators, community meetings, donations, etc. These experiences away from my desk informed the poems I’d eventually write, so I think it’s best to exercise political mindfulness in many forms. As for what kind of writing is most helpful in this context, lately my favorite poems loudly and boldly address injustice and the hypocrisy of those with privilege who look away. I’m thinking specifically of wonderful poems by Jericho Brown and Gabrielle Calvocoressi. What I’ve found interesting, however, is that many do find hope in the book. I didn’t set out to write an inspirational book, in fact quite the opposite—I hoped to voice the frustration I felt as a patient and the anger I feel as a woman in a world that seems to prefer calling women broken rather than bruised, refuses to admit that women suffer from mental illness at larger rates because they face abuse at higher rates and are more likely to have behavior labeled madness. But I think readers appreciate this candor, this mirror, as you describe it, and I know that as a patient, woman, and reader I draw strength from messy, imperfect, utterly complicated texts that leave more questions than answers. Marianne: Jenn, I love the recommended reading list you include at the back of your anthology—a reminder that there’s more to the story, so to speak, than the stories you include. To conclude, how do we balance the desire to share our personal story with the power a writer has to empathically share others’ stories? How conscious were you of building bridges, or creating mirrors, so that others could see themselves in your book? Jenn: Something I’ve spoken very openly about is the need for us in marginalized communities to see stories that do not always speak directly to being marginalized. This doesn’t mean ignore it but it does mean perhaps I don’t always want to write or read about racism. I think in pursuing the authors I did as a fan of their work that I knew they could provide a depth beyond the “pain narrative.” And that’s key. I say so in the introduction of Everyday People that the core strength and goal of this anthology was to see people of color writing stories containing so much of our individual humanity one cannot deny the inherent universality of these stories and the brilliance in the methods of storytelling. When people recognize marginalized folks can and should be able to contribute those stories then we’ll see additional change because these stories aren’t anomalies they’re part of the canon, as they should be. I’d ask white readers, what do you feel more comfortable reading by a person of color? What works have you read that weren’t bestsellers? Who have you suggested for a reading series or paid opportunity or rated their book highly on Goodreads? How diverse are your shelves and your community? If the answer for any of those questions is nil, then that’s the first step. Sarah Fawn: Illness can feel incredibly isolating, but we are a rich, diverse community and I’ve derived a lot of strength from other writers like Terese Marie Mailhot, Sonya Huber, Porochista Khakpour, Molly McCully Brown, and Esmé Wang, just to name a few. So many of us see ourselves in their pages—I only hope to do the same for someone in mine. Marianne: Something I’ve noticed as I share Hillary, Made Up with more people is that many feel compelled to tell me their experiences with makeup–and those experiences are incredibly varied. I love that my book is bringing out this desire in people, and so far it doesn’t seem they need me to do much more than listen. It’s fascinating that so many of us apply makeup every day and barely talk about it. Talking can lead to greater self-awareness, so I hope in my readings of this book I get to have many conversations with people about what beauty means to them. In the case of Hillary, Made Up, I didn’t expect my topic to be such a bridge into others’ personal lives, but I’m really enjoying it and in future projects, I want to pursue other topics that inspire connection. Jennifer Baker is a publishing professional, creator/host of the Minorities in Publishing podcast, and contributing editor to Electric Literature. She has done social media for Sackett Street Writers’ Workshop, the nonprofit We Need Diverse Books (where she was also a panel organizer), and presently for the I, Too Arts Collective. She has lead writing courses in fiction and nonfiction for Sackett Street, I, Too Arts, and independently. 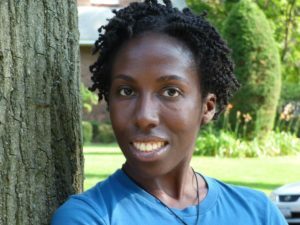 In 2017, she was awarded a NYSCA/NYFA Fellowship & Queens Council on the Arts New Work Grant (as well as their award for Artistic Excellence) for Nonfiction Literature. Jennifer is the editor of the forthcoming short story anthology Everyday People: The Color of Life with Atria Books publishing in August. Her writing has appeared in Newtown Literary (for which her short story “The Pursuit of Happiness” was nominated for a 2017 Pushcart Prize), Boston Literary Magazine, Eclectic Flash, The Offing, Poets & Writers, The Other Stories podcast, Kweli Journal, and The Female Complaint anthology from Shade Mountain Press. She has also contributed to Forbes.com, LitHub, The Billfold, School Library Journal, and Bustle among other online publications. Her website is jennifernbaker.com. Marianne Kunkel is the author of Hillary, Made Up (Stephen F. Austin State University Press) and The Laughing Game (Finishing Line Press), as well as poems that have appeared in The Missouri Review, The Notre Dame Review, Hayden’s Ferry Review, Rattle, and elsewhere. 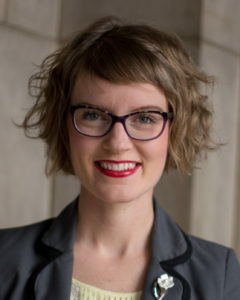 She is an Assistant Professor of Creative Writing and Publishing at Missouri Western State University, where she directs the creative writing program. She holds an MFA in poetry from the University of Florida and a Ph.D. in English from the University of Nebraska-Lincoln. While earning her Ph.D. at the University of Nebraska-Lincoln, she was the managing editor of Prairie Schooner and the African Poetry Book Fund. She currently is the editor-in-chief of Missouri Western State University’s national literary journal, The Mochila Review, and advisor of its campus literary journal, Reach. Her website is www.mariannekunkel.com and Twitter handle is @MarianneKunkel. Sarah Fawn Montgomery is the author of Quite Mad: An American Pharma Memoir, and the poetry chapbooks Regenerate: Poems from Mad Women, Leaving Tracks: A Prairie Guide, and The Astronaut Checks His Watch. Her work has been listed as notable several times in Best American Essays, and her poetry and prose have appeared in various magazines including Crab Orchard Review, DIAGRAM, Electric Literature, LitHub, The Normal School, Passages North, The Rumpus, Southeast Review, Terrain, and others. 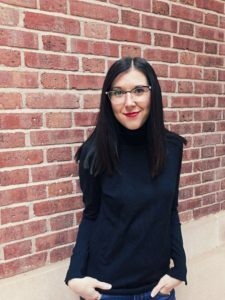 She has worked as Prairie Schooner’s Nonfiction Assistant Editor since 2011 and is an Assistant Professor at Bridgewater State University. You can follow her on Twitter at @SF_Montgomery.